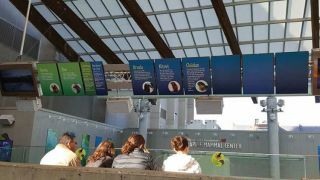 To enhance digital messaging at the New England Aquarium’s Marine Mammal Center, CCS installed new Samsung LED displays and an updated Tightrope digital signage player and software. For many tourists, the New England Aquarium is a premier cultural attraction in Boston, as well as a major public educational resource for the region. One of the ways the aquarium maintains its appeal is by staying current with technology to ensure its visitors have a memorable experience. CCS Presentation Systems was hired at the start of 2016 to help with audio and video enhancements for the aquarium’s New Balance Foundation Marine Mammal Center, Simons IMAX Theater, and Main Building’s public address (PA) system. To accomplish this, CCS began with troubleshooting the existing systems and interviewing the folks working in the area to understand their needs. The devised plan for system upgrades began with rebuilding and updating the aquarium’s existing equipment rack for ease of use, followed with improved quality of audio for the Marine Mammal trainers and presenters. To enhance digital messaging, new Samsung LED displays were installed into an existing truss along with an updated Tightrope digital signage player and software. A new Panasonic HD PTZ video camera with outdoor heated housing was mounted for live streaming and recording of programs and events. A Denon solid-state audio player was installed for audio playback of marine sounds. A Crestron 3 Series control system with a 10-inch touchpanel was put in place for simplified control access. Shure wireless microphones were updated with an antenna system to extend reception. QSC audio mixers, amplifiers, and speakers were installed to enhance the audio system, and racks with auxiliary input plates were integrated for added connectivity options. The goal for the IMAX Theater was to consolidate and update the existing AV systems to a single, neat, efficient, and easy-to-use system. The goal for the IMAX Theater was to consolidate and update the existing AV systems to a single, neat, efficient, and easy-to-use system. CCS was also asked to provide, install, and integrate a new presenter-friendly podium with a digital clock, gooseneck light, and microphone. To achieve these goals, CCS traced all cables and paths to document signal flows and active equipment. After troubleshooting and customer consultations to understand the needs of various guest and employee requirements, an updated and simplified presentation system was designed and installed. With AV systems continuity in mind, a Crestron 3 Series control system was again installed for simplified control access. An NCast Hydra presentation system was incorporated to work in tandem with all of the systems to make a YouTube channel where programs can be streamed out live. Finally, A Euro Design custom wood podium was integrated into the space, which included a pull-out drawer, drop-leaf side shelf, clock, light, microphone, and Extron Cable Cubby. Being that the IMAX Theater was a room redo, there were challenges to be taken into consideration. “There were only windows of opportunity to rewire the existing system in one-hour increments while an IMAX show was under way. Once that show was completed, our system had to be ready to go again,” Wiley said. CCS took the existing system and revamped it to create an easy flow of audio signals to make it easier for presenters to use, record, and stream. The third AV challenge was for the PA system in the Main Building. All department stakeholders of the New England Aquarium wanted a more flexible system that could be used in a modular way, allowing each of their department’s needs to be met, with better audio clarity and ease of use overall. Many events are hosted throughout different areas of the building, creating a need for great flexibility of many zones. CCS and NEAQ spent many hours discussing requirements and reviewing suggestions, before designing a complete system to meet everyone’s needs, while incorporating as much of the existing system’s useable gear to save budget. Custom XLR microphone and stereo audio input plates were installed throughout seven areas, allowing audio players and/or microphones to be set up quickly for local area presentations. iPad control via an app was added for portability of system control. Two paging stations with gooseneck microphones were installed at the lobby desk with pin code access. Seventeen zones were updated and two DJ locations were added for events. A new QSC QSYS system was installed with programming and display capabilities, adding new features and expandability for the future. A web-based interface allows users to adjust settings and to schedule events or import audio files, allowing audio to play throughout the main building or in all of the zones of the main building. With the completed installation, nearly any event or use case has been accounted for and implemented, with room to grow.